Today’s post is about the actual reason I’m in Japan- research. In addition to chronicling how much food I’ve eaten from 7-eleven (my best estimate is about 5.5 pounds*), I should probably talk about the work that I’m doing that the NSF has generously decided to pay for. In my biased opinion the project is actually pretty interesting. It’s also pretty simple too. *5.5 lbs is a really rough estimate. If I eat around 2000 calories per day, and about 25% of of that is from 7-eleven, over the last 20 days I’ve eaten 2000*0.25*20 = 10000 calories from 7-eleven. Its mostly rice and fish, and since protein and carbs both have 4 grams per calorie, that’s 2500 grams, or 5.5 lbs. This is a lot less than I expected. The basic idea is that air can act like a lens, because the index of refraction of gases is proportional to density. The problem is that its a very weak effect, which is why you rarely see it in day to day life. You can see air bending light rays when you look at hot air right above pavement on a hot day. Its also the reason stars twinkle- there’s 5 miles of air** between you and space, so small changes in density make the light from the star flicker a little. Anyway, its very weak. **The atmosphere is a lot thicker than 5 miles. That’s the effective thickness of the atmosphere if it were constant in density instead of getting thinner with increasing altitude. Like how much food I’ve eaten from 7-eleven, its a lot less than I expected. Fortunately there’s a cool optical technique that’s existed since the 1860’s called schlieren visualization that is much more sensitive to these changes in density. Its a great tool for studying fluids, but it has its drawbacks- namely that the optical equiptment is expensive and it takes forever to get the mirrors and lenses aligned. 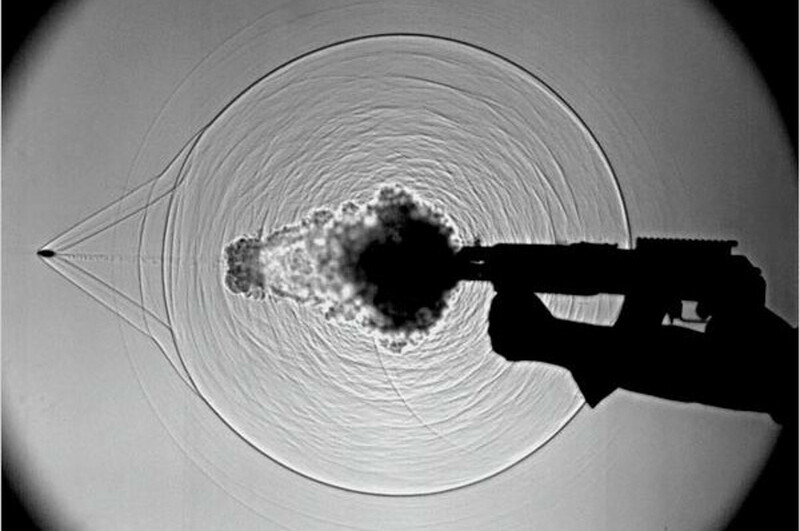 About 16 years ago a new method emerged called background oriented schlieren. Rather than using optics to enhance the weak effect of air refracting light, what if you just took a regular photo and used a computer to enhance it? With BOS you place an image on the other side of the air you want to study and take a photo of it through that air. The image is typically chosen to be a pattern of dots because its well suited to being processed with computers. One drawback is that its computationally demanding, so you can’t process the images in real time. That’s where S-BOS comes in. S-BOS involves using a pattern of stripes instead of random dots. It has drawbacks that I’ll get into in a later post, but the advantage is that it’s really fast and simple. I made this video by applying the S-BOS method to every schlienren experimentalist’s favorite density gradient source, a candle. The video is by no means a good representation of what S-BOS can do- this was just my crude first attempt after throwing together a script in MATLAB. So the short answer for what I’m here to do in Japan is to learn this method from Prof. Tsutomu Saito and Dr. Kazuaki Hatanaka, and then do experiments to try it out. We’d like to improve on S-BOS, or at the very least quantify how it stacks up against regular BOS. I’ll get into the details in another post. Honestly I’ll be blown away if anyone other than my mom or my twin brother reads this far through the post.